Waiting for hope to arrive is maybe one of the most difficult things. Trusting that one day relief will shine on the horizon and there will be a visible finish line to the race you have been running is one of the most challenging tests of faith. To still believe in the light when all you can recall are memories of darkness, that is faith. To trust in the hope of the light when the horrors of the darkness engulf your life, that is faith. Sometimes hope is found not in rays of sunshine or in the chirping of birds. Sometimes hope is found in the thundering storm clouds or the roaring wind. Hope is sometimes just as much inaction as action. When you’re shaking in despair on the floor and life is endlessly spinning around you in chaos, Hope is the choice not to reach for something to dull the pain. When depression and panic hit you in the middle of the day and you’re not sure where you will find the strength for the next hour, Hope is the decision not to leave, but to stay and trust that God will be faithful. Hope is the choice to try, to get out of bed and go to school because maybe today you will have the courage. Hope is walking into class with a tear-stained face despite the scornful looks because hiding and avoiding are not living. Hope is not letting past failures and mistakes in relationships keep you from trying to make a friend again and giving yourself permission to love again after your heart has been broken. 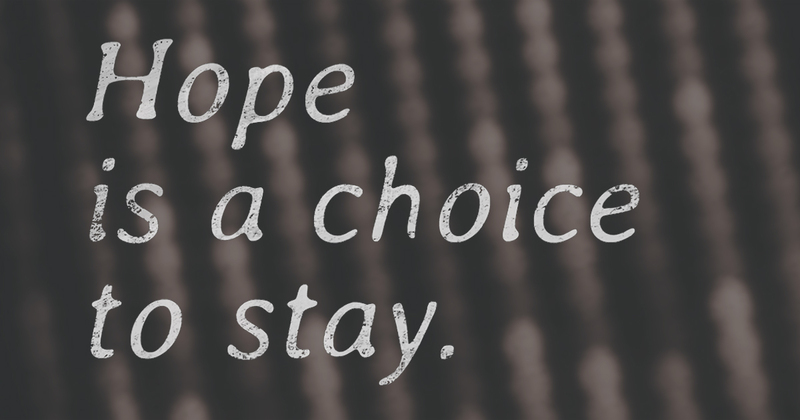 Hope is a choice to stay. When we are climbing the mountain of life, the path becomes steep and treacherous, and our weary legs cannot continue on, Hope flies ahead on the horizon. Her song tells of the beauties that wait ahead. The shadows are long and Hope is often invisible, but if you listen well, you might just hear her song. this is incredible and i am thrilled to share it if that’s ok? When I read through these blogs I finally felt “Hope is the choice to stay.” A rx withdrawal took everything and I felt I had nothing to offer. I accept I am broken. I accept it may not get better. But I can stay and love myself broken as ever so that I may be able to find others real as me and broken as ever and love them too. Sometimes with nothing to offer, is everything. We are so sorry that you had a bad experience with withdrawing from your medication. Please know that while you may feel broken and that you cannot get better, we believe there is still hope. Your courage to stay and continue loving yourself and others is amazing. We are so grateful that you are here and that you are staying. If you want to tell us more about you and your story, please email our team at info@twloha.com. It would be an honor. Exactly how can you believe in hope? Especially when the very reason your in existence doesn’t want you anymore just because you like the same gender. I feel I’m sinking in this river made up of mistakes and tears. I wanna scream but these words aren’t coming out. They are stuck in my heart behind the cage of my ribs. Pounding about to burst out but then stopping and sinking back again. The thing is, I do believe in God and I do believe in hope. But my fears are starting to weigh upon my chest and all I want to be wanted,to be loved. We are so sorry that you’re going through such a difficult time. We hope you know that you are absolutely worthy of love and hope. Hope can be hard to find when you’re struggling or facing something heavy and dark, but know that it is still there. And we can see it just by you have the courage to reach out and comment. Please know that no matter who you love, our entire team in Florida believes that you deserve to love and be loved. And we are here to support you in any way that we can. You can always email us at info@twloha.com. We will read and respond to your email as soon as possible. Please don’t hesitate to reach out to us further. Hope is so powerful. Even if it’s a fond memory, a furybaby, a kind word. It gets me through times that would have destroyed me before. This is so well written. Keep up the wonderful writing. Hope keeps us all going. I have “hope” tattooed on my wrist as a constant reminder that beautiful days are somewhere ahead. Beautifully written. Thank you for sharing & contributing to my HOPE. We are so sorry to hear that you are struggling right now with such heavy thoughts and emotions. What you’re feeling is valid and we hope you can find healing soon because you deserve to. Would you email our team at info@twloha.com so we can get to know you and your story better? It would be an honor to offer you some support and encouragement.